Scientist: Tech could be used "to build a functional brain-reading device"
(WIRED) -- Scientists are one step closer to knowing what you've seen by reading your mind. Researchers used fMRI technology to try to pull images out of peoples' brains. 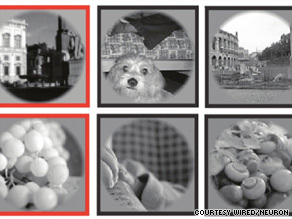 The current approach, described this week in Neuron, uses a more complete view of the brain's visual centers. Its results are closer to reconstruction than identification, which Gallant likened to "the magician's card trick where you pick a card from a deck, and he guesses which card you picked. The magician knows all the cards you could have seen." He mentioned medical communication devices as a possible application, and computer programs for which visual thinking makes sense -- CAD-CAM or Photoshop, straight from the brain.